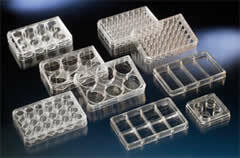 MicroWell Plates are used in a broad spectrum of applications, including cloning experiments, sample incubations, and in tissue culture based analytical systems. 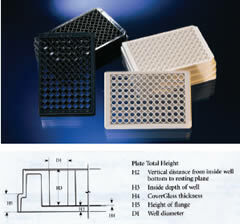 Our MicroWell Plates have excellent cell attachment. All styles are designed to be stackable and are radiation sterilized. They are Terasaki format plates measuring 56x82 mm and having 60 or 72 wells. Wells are shaped like inverted truncated cones, each with a working volume of 10µl. The well surface is Nunclon® treated for good cell attachment. Lids incorporate a stacking feature and are tight-fitting, which reduces evaporation. These plates measure 86x128 mm and come in either flat or round bottom wells. Vented lids allow for gas exchange and have condensation rings to control evaporation and retain condensate. Lids are keyed so they cannot be accidentally reversed. Plates have alpha-numeric markings on its two edges. In addition, flat bottom plates have individual well coordinates beside each well for easy well identification when using an inverted microscope. Plates also have raised well rims to provide proper attachment of adhesive sealing film. NUNC™ Brand Thernanox®, or TMX coverslips are made from a polymer (in the polyolefin family) that is highly resistant to most chemicals. Thermanox® plastic is resistant to alcohols, aldehydes, hydrocarbons, dilute acids (<10%) and dilute alkalis (<2%). 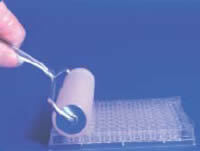 TMX has limited resistance to chlorinated hydro-carbons, however, it is not resistant to concentrated acids or bases.Thermanox® plastic is a flexible, trans-parent polymer that can be sectioned using a microtome and is able to withstand high temp-eratures (temperature range -70°C to +150°C). Thermanox® coverslips are culture treated on one side for enhanced cell attachment and growth. The treated side is packaged face up toward the label. 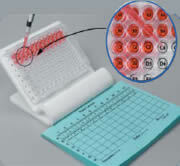 Convenient visual aid for pipetting and identification of samples in microplates. Sharp, alpha-numeric characters compatible with 96-, 48- or 24-well microplates. The markings of each filled well are easily readable. Sterile – Sterilized by gamma irradiation. Films are also free of cytotoxins. Prevent Contamination – Films eliminate well-to-well contamination, microbial and viralcontamination, evaporation (excluding breathable membranes) and sample spillage. 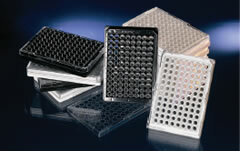 Ideally Sized and Designed – 6"x3.25" rectangles fit all microplates. Two scored end-tabsmake film positioning and removal hassle-free. Thermal Stability – Designed to withstand a wide temperature range. Easy Specimen Retrieval – Pierceable sealing films facilitate easy removal of samples with a pipet tip. A Rapid Gas Transmissable Sealing Membrane for Cell Growth. Breathe-Easier membranes permit rapid, consistent gas exchange of Oxygen, CO2and Water Vapor for uniform cell growth. Titer-Tops prevents sample evaporation, well to well contamination, external contamination and sample spillage. Titer-Tops are made from 4.4 mil polyethylene film with an FDA approved non cytotoxic acrylic adhesive. Each pre-cut rectangular sheet is 6"x3.25" with a paper liner. The center section of the liner measures 5"x3.25" and once it is peeled off it leaves two hand-grip extension tabs on the two ends. These tabs allow for easy application of the Titer-Top to the plate. Titer-Tops are chemically resistant and thermally stable. The acrylic adhesive is waterproof, solvent resistant, and compatible with all plastic microtiter plates. Titer-Tops will stay in place even when exposed to 100% humidity and temperatures ranging from -40°C to 100°C. They are easily pierced with a micropipette tip to provide access to sample wells. Titer-Tops are gamma sterile. Hinged clear acrylic sealing film storage box with non-slip feet for storing and dispensing microplate sealing films. Conveniently remove films one-at-a-time with one hand. Uniformly seal your films to microplates with Brayer. It's perfect for all your sealing films. Remove the paper liner and adhere the membrane to the tube opening. In addition to normal well working volume. 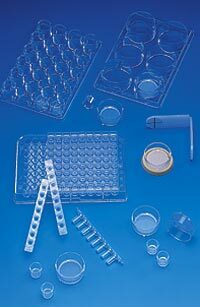 Nunc Cell Culture Inserts – Polycarbonate membranes Sterile.